The new government want to plant 100 million trees over 10 years to support achieving our climate change commitments. Northland has roughly 5.1% of New Zealand’s land area, so that equates to about 5.1 million trees for Northland per year. Of course we should probably have more, as we don’t have snow here and trees will grow faster than most other places, and therefore sequester carbon quicker. No doubt many of the trees will be pine and hopefully native trees. I would like to see a commitment that a percentage of the trees are food trees, or trees that support or compliment food production, e.g. shelter belts, farm forestry, manuka and kanuka. There may be opportunities to support such plantings. It would be too easy for the planners to focus on pine trees and reforestation. It also makes a lot of sense to be planting food trees in parks and streets in urban settings and in schools. If we are planting trees to sequester carbon how do large fruiting plants such as avocado trees, macadamias or bananas compare? This article establishes sequestration rates for macadamias in Australia as 3tons CO2/ha per year. I can’t find data on sequestration for bananas and avocados, but we can compare pasture, native shrubs and trees for a rough estimation. Here are some examples of sequestration rates. These numbers are from this webpage and the Tane’s Tree Trust website. They are sometimes aggregated to establish a range and variables include tree age – the max figure for totara is from a 102 year stand. Notice the graph below indicates a higher value for pine. From this table, we can surmise that bananas, for example would sequester at least as much carbon as the minimum numbers for manuka/kanuka. If anyone has data on banana or avocado biomass, please let me know. This graph, from the Tane’s Tree Trust website reveals the growth and sequestration rates of different species. Notice that in the short term, native shrubs out perform native trees. We can assume bananas in Northland might follow a similar trajectory to native shrubs as they quickly bulk up. Pine trees offer rapid growth rates, but harvest processes remove the above ground biomass and can create significant erosion of topsoil and therefore soil carbon, especially on steep land. On the other hand, as with any timber, incorporating wood into constructions sequesters that carbon for decades. Timber plantations are important, but we need a broader assessment of their environmental, social and economic value. For example for every 1000 hectares forestry and logging employs 3 people. By contrast, for the same area, dairy employs 19.1 and horticulture 101 people. 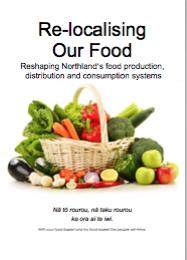 Thus, monocultural forestry depopulates while horticulture can repopulate rural Northland. Michael Pollan charts a pathway to good health “eat food, not too much, mostly plants”. If we help Northlanders to have plenty of access to food trees, and some of it free in schools and public spaces, we can support better health. I would like to see a message sent to the relevant Ministers, and the Regional and District Councils encouraging a target for food trees as a percentage of the 100 million trees to be planted annually. Ideally it will co-signed by relevant organisations, eg, Tropical Fruit Growers, Tree Crops Associations, Enviroschools, Health agencies (fruit trees for schools, parks and streets), and marae. If you know of organisations to approach for support for this message, please provide the name and the name and email of a contact person.